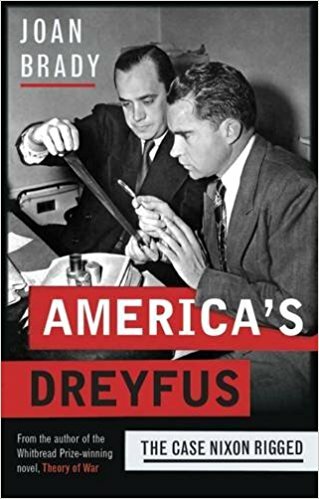 America's Dreyfus written by Bestselling Author Joan Brady author of the Theory of War writes on the trial of the century during the Nixon years. Similar to incumbent Donald Trump, Richard Nixon also had a single aim in life, "Win". In 2016 this book had so many reviews about the real story of Alger Hiss. Joan Brady believes that Hiss was innocent but thinks, as did many of his friends at the time, that he was suicidally naive about what he faced. Chambers had appeared before HUAC in 1948 and, in the fashion of the day, had produced a list of alleged communists in government service. The main summary of this book is that it is about the dirty tricks employed by Richard Nixon and his allies in the late 1940s and early 1950s to secure the conviction of Alger Hiss, a former government official, on a trumped-up charge of perjury. Thus, the start of the discussion on the statements of conversations could have been taped, was just a strategy to ensure the loyalty of Former FBI Director James Comey. Trump admits: 'I did not make, and do not have' tapes of Comey conversations. The referencing of this book is not about Alger Hiss or Joan Brady. It's mostly to look into the present scenarios depicted on the case of whether President Trump does have a case for impeachment or are we just not used to the Trump ways of someone who has never held a public office prior to becoming President. Likewise, the new era of a President being pro-active on the social limelight of "Twitter" is also new to the world of political science. As of this writing, the travel ban case being withheld to certain muslim countries for the last few months has finally been lifted by the Supreme Court. Stricter port of entry laws in the US had been announced and a celebrated case about an undocumented immigrant arrested in a sanctuary city as San Francisco, CA. Since January's Presidential inauguration, a lot has happen, a lot of issues are on the table including the Senate version of the Trump Care Act replacing the Affordable Care Act. Right now, there are pros and cons about how the administration is performing but at the same they are the sitting administration. We should continue to be vigilant watchdogs yet to some let us let history pave it's way.